I feel like I've been a terrible blogger this month. In the midst of all the regular holiday preparations, illness swept its way through our house ... twice. First it was the good old cold, then stomach flu hit. Yuck. I would rather clean up ANY mess than stomach flu mess. Not good times. And then I had all these fun Christmas activities planned for my last week of school, but they were thwarted as well. The Wednesday before break all the teachers in my school board were on strike (we've been on rotating one day strikes in Ontario) and then a HUGE winter storm hit on Thursday and all our school buses were cancelled on Thursday and Friday (buses get cancelled, but our schools are always open ... thank goodness for snow tires).. Since the large majority of our students are bused to school, we had very few students the last two days. On Friday I only had FOUR students. So ... plans changed. 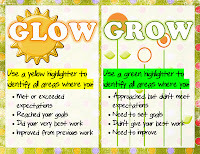 I think I'm most proud of my two assessment freebies I've shared - Glow and Grow and Traffic Light Comprehension Dots. Both are for quick self or peer assessments. I use both methods all the time in my class, and students often complete them before I even ask. 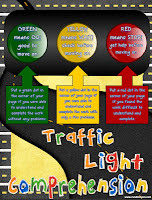 I tend to use the traffic light dots most often in math, and the glow and grow for writing and reader responses. I uploaded the pdf documents to Vistaprint this summer and had posters made that hang in my classroom. You can read about my blog post explaining how I use the assessments HERE (the post includes links for the free posters). My most viewed blog post of 2012 is my post on my Paper Bag Character projects. You can read about it HERE. This is the second year I've done this project, and it has been a BIG hit with my students (and a big HIT with me as I've been so happy with the quality of work they produced). I love sneaking in art projects whenever I can in the classroom - and because visual arts is one of the subjects I have to assess on our report cards, I can sneak it into our curriculum without any guilt. I love sharing our art projects on my Friday Art Feature posts - I have so many fantastic little artists in my class I feel their work deserves a little recognition. This is a hard one to choose, but I think my favourite art project was our Mingling with Monet project. This was one of our last art projects of the year last year, and the kids were SO proud of their masterpieces! This would have to be my Interactive Math Journal - it's my best-selling product, the project I'm most proud of, and hands-down the best addition to my classroom. When I say I worked hard on it all summer, that's a lie. It was really a work in progress for the whole year. I started interactive math journals in my classroom in September of 2011 and never looked back. I couldn't believe how excited my students were to work in their math journals ... and that excitement hasn't subsided - for me or the students. They are excited to show other students their work and ask to bring the journals home to share with their parents. Who can ask for more than that?? I've been so overwhelmed by the response I've gotten from teachers all over the world, and I'd like to take the chance to sincerely thank every one of you who has left me feedback or commented on how they use math journals in the classroom. It is mind-boggling to me to think that students all over the world are using these ideas. I love sharing these ideas on my Math Journal Sunday posts, and promise to be back in January with a whole new set of ideas. I saved the best for last. The best thing about my year of blogging in 2012 has been the friends I've made. What went from "I saw this neat idea on someone's blog ..." back at the beginning of the year, has now become, "My friend, _____________, posted about the coolest thing ...". These people have truly become my friends. My students have benefitted from them. I have learned from them. And I am a better teacher because of them. Over a year ago, I would never have thought the people behind the blogs I read would become true friends. But they have. MANY of them. And it's the absolute COOLEST thing! Stephanie from Teaching in Room 6. LOVE this girl. Truly. Maybe even to the whole stalking point ... ;) There isn't a single thing that Stephanie has done that I haven't LOVED. Nope, not one. Mor from A Teacher's Treasure. LOVE this girl. She's my favourite foldable friend ... I wish I could fold her right up and stick her in my pocket. (I hope that didn't sound too weird). Mor is going to have an incredible year in 2013 and I am so happy for her. Kim from Finding Joy in 6th Grade. LOVE this girl. Kim never fails to leave the sweetest comments on all blogs. She just has this special way of making you feel ... special. I wish I was one of her students ... I know without a doubt she has the ability to make each and every one of them feel special. 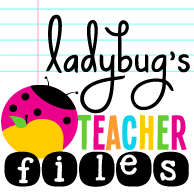 Kristen from Ladybug's Teacher Files. LOVE this girl. The first time Kristen left a comment on my blog I just about FELL OVER! I had been following her in AWE for quite a while as one of my bloggy gods. I wish I had an ounce of her creativity and passion for design. Kristine from Young Teacher Love. LOVE this girl. I just "found" her late this summer. I love all the ideas and pictures she shares from her classroom. Elizabeth from Fun in Room 4B. LOVE this girl. And LOVE all the fun ideas she shares from her classroom. Her students must be SO excited to come to school every day. I can only hope I can inspire my students like she does. Oh my goodness, I could go on and on. I have SO many favourites. I'm from such a small school, I'm pretty much the only teacher in my whole junior division. I dream of being at a larger school where these FABULOUS ladies would be part of my "team". OMG - what a team we would make!!! So, that's about that. I love this end of the year reflection - I make my own students reflect so much, it's only fitting I take it on, too. If you made it all the way to the end of this very verbose post, what were some of your BEST ideas of 2012??? 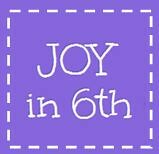 I love yiur blog and your TpT products are amazing! I am thrilled to be your newest follower! Thank-you so much, Kathy! Welcome! I hope you find some ideas you can use in your class. 2012 really has been an amazing year for you and you so deserved it! I am so thankful for your friendship! Hope 2013 proves to be even better for you! YOU are one of my favorites! I check your blog every day - no stalker here, just a teacher gobbling up every great idea. I love the ideas that you have for your kiddos and can't wait to see the latest art work. I have art envy - more challenging to integrate Monet into my math class but I'm working on it. 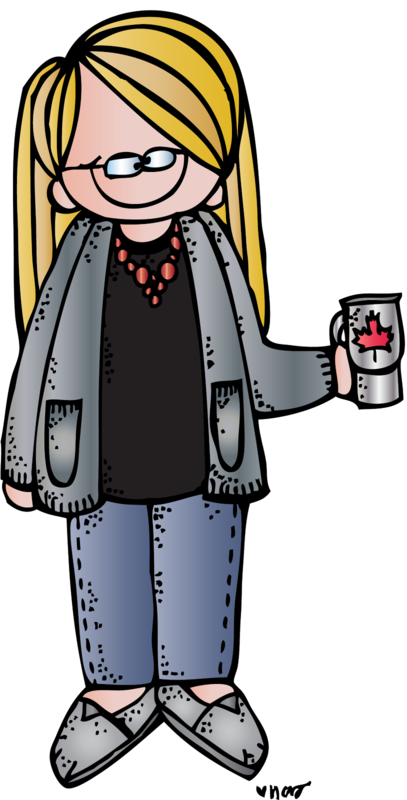 I wish a brilliant, healthy, and joyful 2013 for you and yours (and the Canadian teachers as well!). Thanks for linking up! Your blog is a fav of mine so I was pumped when I saw you had linked up! Thanks for all that you share and do! And I LOVE this girl. Mwahha! You truly are an inspiration to us all. You make all of us better teachers. Thank you for those interactive math journals, by the way. I haven't started yet, but I have been studying your fabulous resource and am looking forward to jumping in. 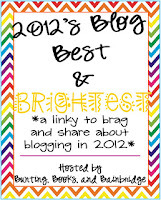 I found your blog through the Best and Brightest linky party and I'm your newest follower! I just started doing interactive notebooks in science this year and I LOVE them! I will have to check out your math notebooks. Love love love your blog. I have shared your blog with so many colleagues, they became followers and we talk about your latest posts at lunch. Because of you- 6 of us are doing interactive math journals and we love them. Thank you for everything you share. LOVE your blog...you are one of the reasons why I started blogging. I hope someday to touch as many teachers as you do...I love learning from others and love being able to give back--so I think my "favorite" from 2012 was finally mustering the courage to join all you other bloggers! It has been a lot of work--but I have found my new passions. Thank you. Happy Dance. And Sappy Dance. That makes it a SaHappy Dance! Oh MyBuddyJen. It made me cry to see my bloggybutton on your list. (It is rather hard to miss, eh?) (Ummmm. I think that's Canadian for "Donchathink?" heeheehee). Thanks for all you have shared--from your blog and from your heart! I agree with Steph...you are the one that makes me a better teacher and I can't thank you enough for everything I've learned from your incredible teaching!! Love ya Jen! I agree with Kristen. It is YOU that makes my young teacher self a better teacher. Thank you for inspiring me my friend!!! I am such a young, new teacher and I can only hope to be like you someday, Jen! Thank you for your kind words! Love ya girl! Thanks so much for introducing me to the other bloggers. They have GREAT ideas. Your favorites are mine as well. I feel so rejuvenated in my teaching thanks to you and the others on your list of bloggy friends. I do not blog as I feel I'm definitely not adequate enough to but I follow all of you and you've made teaching fun again! Thanks for all the terrific ideas. Between the blogs I follow and Pinterest I can join others who teach in my style and boost my teaching to the next level. I'm rambling. So THANKS! Very inspired by your passion and fantastic resources. I'm addicted to Pinterest and teacherspayteachers!!! Loving it! from Fran in Australia!